Prince George, B.C. – The Caledonia Ramblers Hiking Club has been awarded a 2016 BC Parks Volunteer Award. They’ve been recognized for their work in making the Ancient Forest/Chun T’oh Whudujut Park and protected area a reality. That work included meetings with government officials and collaboration with local First Nations and UNBC to highlight the cultural and scientific significance of the area. 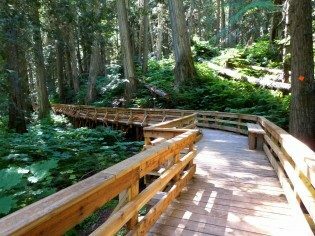 And along with maintaining the area, the Caledonia Ramblers also built a 456-metre-long universal access pathway so people of all abilities could enjoy the ancient cedars. They also built another 2,210 metres of boardwalk to showcase Tree Beard, Radies Tree and Big Tree, along with an extension to a waterfall in the park. According to the Province, more than 14 per cent of B.C.’s land base makes up the 1,033 parks and protected areas we have. The ‘Ancient Forest’ is not a cultural thing, it is nature at its finest and awesome to say the least! I understand that a student accidentally found it years ago. Been there a few times, the Hiking club has done an outstanding job setting the planked trails up. No idea what the other group has done. But it is a tourist attraction anyways! I guess you do not understand that “nature at its finest” is a cultural thing for indigenous people all over the world who relied on the land and its resources for their existence as hunters and gatherers. 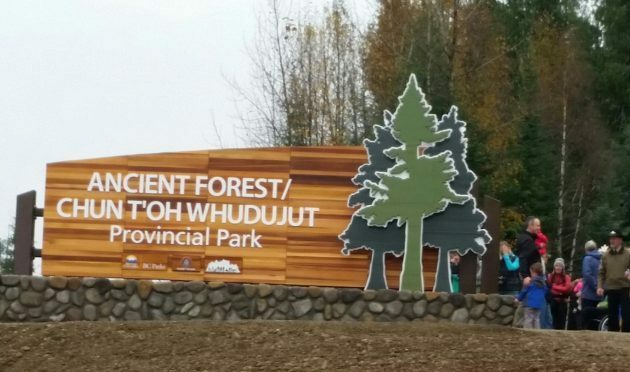 Cultural Heritage: Ancient Forest/Chun T’oh Whudujut Park is located within the Lheidli T’enneh traditional territory. The Lheidli T’enneh people would visit the stands from summer fishing camps along the upper Fraser River. They had no written history, so we have to rely on their folklore unless there are actual marking on “culturally modified trees”. There are enough of those around the Prince George region. Whether there are any of them there, I do not know. This award is so well-deserved! The hiking club spent hundreds of back-breaking hours hauling materials and building the steps and trail system so that everyone could enjoy the park, and at the same time, lobbying the governments to keep the place a protected area for all to enjoy. Well done, Caledonia Hiking Club members who were so dedicated to completing this project! Funny they had to include a certain name on the sign, considering it isn’t theirs, it isn’t a traditional ground, and nothing would have been done to it without the awesome work of the ramblers. Does every single thing have to be recognized now? You had to ask !!! If you read the description of the park, as I posted above, it is on traditional ground and has been claimed as such long before the ancient forest was discovered. If you wish to dispute that land claim, be my guest. No matter what, the land, whether every square metre of it or not, was settled by the first nations when the Europeans and Russians came here. It was not uninhabited. “modern humans” met the “stone age” hunters and gatherers as well as farmers in parts of the country and due to their armaments and deceit, “conquered” them. Time to get over it. It is really not all that difficult. I do not agree with this, there is evidence that the land bridge from Asia created the first people to cross. They are the First Nations in reality. All of Canada is not traditional ground, as it seems like every time a person turns their head there is a ‘traditional land’ dispute. Did they put any back breaking work in this beautiful forest? Highly unlikely, the credit goes to The Hikers! I was born here, so I am a Native Canadian also. My own take of course. LOL I will ‘get over it’ once the natives get over it about everything being theirs without putting any effort into projects such as this. When did you first hear of that? Do you think God sent a helicopter and seeded the continent with microscopic humans and the rain caused them to grow? In that case, not all of Canada is the ground of more modern explorers and immigrants. Not every single piece has been touched by human feet, whether they came thousands of years ago across a land bridge or came by boat or plane. Those who came across the land bridge and those who came by sea in the southern parts of the Americas, did not land and plant a flag or a Tiki or a piece of leather and utter the words … “we claim this land in the name of Polynesia” or Mongolia or whatever. Think about this a bit more and try to place yourself into their shoes. Do not think about it with the well established cultures of 500+ years ago European countries with monks and other scribes who made laws and had armies to enforce those laws. And I missed it all the hard work. Hiked a few miles with the club but missed all the hard work. What a great effort. A rose by any other name , would still smell as sweet . Not going to get into it with you GOP. I guess I am getting tired of the handouts at my expense and other hard working Canadians. How long is the system going to be milked before it is realized that it is time to get on with the program instead of the proverbial ‘crutch’ is done away with and they start helping themselves. Can’t keep on going this way bud! When is the line drawn? I can go on but my point is there. I will not place myself in their shoes, my ancestors had a tough go of it in Romania and surrounding countries when the upheaval happened years and years ago I am not going to get on the bandwagon and say ‘poor me’! A little distracted view but what the heck eh? LOL. have a good day, no smoke and cool temps. happening.